Why Service at Subaru of Grand Blanc? Choosing to invest in a Subaru is a big decision, and here at our Subaru dealership near Fenton, MI, our main goal is to keep you fully satisfied throughout your entire ownership experience. That's why in addition to an outstanding sales team, we also maintain a knowledgeable service staff that can assist you with any type of maintenance your car may need. Whether it's time for your routine oil change and tire rotation or you require brake repairs or a transmission replacement, we're here to assist you. Our skilled team of Subaru experts is comprised of factory-trained master technicians who work hard every day to ensure your vehicle's health is up to speed and it's always performing its best. They know your Subaru better than anyone, and are sure to diagnose and repair your vehicle correctly the first time. Plus, our factory-trained service advisors are here to explain every aspect of your service visit to you, and make sure you understand what we're doing to maintain or improve your vehicle. If you have the misfortune of being involved in an accident and you're looking for a collision center you can trust, we can help you there, too. As a part of the Al Serra Auto Plaza, we have the advantages that come with an on-site body shop. Anytime your Subaru requires more extensive repairs, just visit our body shop in Grand Blanc, MI, and our skilled technicians will fix it up and have you back on the road in no time at all. 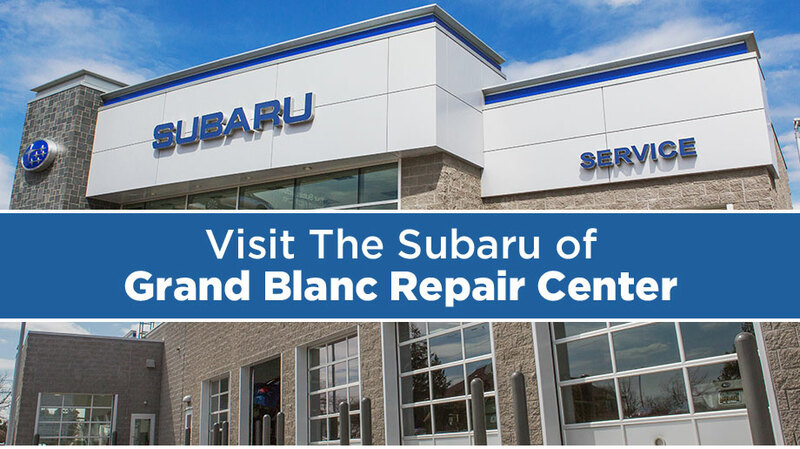 Use our easy online system to schedule your service appointment today, and come see for yourself why Subaru of Grand Blanc should be your choice service center. Why should you service at our Grand Blanc, MI, service center? We have four service bays -- all stocked with state-of-the-art equipment -- so the wait won't be long and you'll be in and out quickly. We use OEM Subaru Parts when repairing your vehicle to maintain its excellent condition. While you're waiting for your vehicle to be finished in our shop, take advantage of free Wi-Fi and coffee in our comfortable waiting lounge. If you want to continue about your day and pick up your Subaru later we offer a free courtesy shuttle to anywhere in Genesee County. Anytime we service your Subaru, we'll wash it for free!